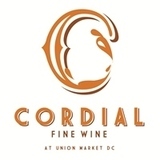 Updated every Friday For special orders, email info@cordialwine.com or call (202) 548-2450. This German Style Maibock is made to celebrate the opening of our biergarten season. Dry-hopped sour ale brewed with Muscat grapes. It's starts out like a light beer then finished like a rosé champagne. Brewed and dry-hopped with Galaxy and Equinox. Open fermented with brettanomyces and lactobacillus. The aroma of this tropical pale ale is mix of rich coconut, the delicate citrus of mosaic hops, and pineapple. Briney Melon Gose boasts a thirst-quenching tartness that is perfectly balanced by subtle watermelon flavors and aromas. A style truly born of Californian roots, our Brut Extra Dry IPA has a very aromatic nose thanks to ample additions of Simcoe and Amarillo hops. Brewed and fermented with almost no residual sugars, a generous amounts of Chinook hops impart clean, citrus flavors with a moderately low bitterness. This smooth, sweet Berliner is made with a big dose of oranges, milk sugar, Mexican vanilla, and Madagascar vanilla. This beer distinguishes itself from the German-style pilsner due to its softer water profile and the use of Czech Saaz hops. A bitter, moderately strong American India pale ale that uses its clean, supporting malt to showcase its hop character with a strong aroma of grapefruit. Refreshingly tart and infused with hibiscus for a pleasing round herbal flavor and gorgeous pink hue. Blackcurrants are also added for hue and aroma. Stiegl Grapefruit Radler has a distinct tart flavor, citrusy aroma, lively effervescence and natural cloudiness. Vietnamese-Style Coffee Stout inspired by the popular Vietnamese coffee drink called “Ca Phe Sua Da” (cah-fe sah dah). With brown sugar and cream extract. Our inaugural cider, made with local apples & fermented with Sauvignon Blanc yeast. Bright acidity with notes of juicy peach, apricot and lemon. A raw material of exceptional quality that allows Eric Bordelet to develop typical and authentic Haute Couture ciders and Poirés. Isastegi is an old family estate located in the town of Tolosa in the Basque Country of Spain. Pale gold in color and complex with a light spritz. A traditional dry cider, it has a rich apple fruit character with a piccante wild note and a tart, lingering finish. Pours clear golden with a fizze, white head. Aroma is sweet, some green apple and light sulphur. Drinkable, refreshing and a bit more delicate than a traditional hard cider, BRIGHT is tank fermented and made with 100% Leelanau County apples. From a very clean flavor profile that goes 100% to the aromas of apple, cider we offer is dry, very fresh, with an acidity that allows drinking eager. Refreshing blend of sour and dark-sweet cherries taken clean with a champagne yeast re-fermentation; light carbonation.